Well, it has become a tradition to brew a different X-Mas Ale every year. 2014 will be the six year of this tradition. Each year is a different recipe, but so far all have been dark and malty with some sort of festive spicing or special flavoring reminiscent of winter. They have all have been pretty high in alcohol, and I expect that I'll continue that tradition as well. The 2014 version of the beer is exactly the base of 2012, and therefore pretty close to the base of all the others. My first brewing year, of course I knew I wanted a special holiday ale. It would be a high-alcohol, flavorful beer to help keep me warm on cold winter nights. 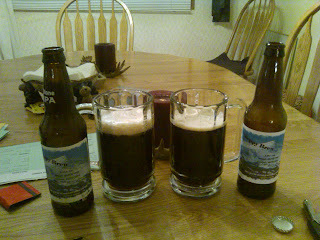 I came across Ol' St. Nick's Midnight Ale on the Mr. Beer website, and decided to use it as a base for my own recipe. It turned out great. It was dark and malty with few hops but some spices and fruit to make it a more special (festive) beer. 2010 was an all-grain batch. The base beer was designed to come as close to the first year as possible. The recipe used medium to dark caramel malts and some chocolate malt on top of the pale 2-row. It was different in that its main spice was apple pie spice. But for the most part, it turned out very similar. I do believe it also used less hops which helped give it a sweeter flavor. 2011 was also an all-grain batch. It was a similar winter warmer base with hazelnut flavoring left over from the Bluefield experiment. I also added 1 tsp of cinnamon at bottling time. 2012 was more or less the same base with peppermint as the special flavoring. 2013 combined my SheppyBrew Styles goal with the X-Mas Ale tradition to make a rich caramel beer with significant German smoked malts to make a Category 22B Other Smoked Beer. As I mentioned above, 2014 is just the base beer of the other recipes. 2016 was another peppermint beer. 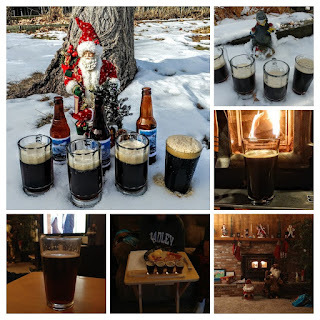 Another part of the tradition is doing vertical tastings on my X-Mas Ale every year to see how age affects the beers. It was a very interesting experience the first year. I just have to remember to save enough of these.